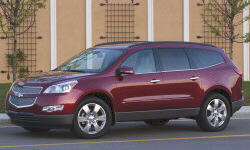 Chevrolet Traverse Pros and Cons | Page 1 of 1 | Why Not This Car? What drives people to buy (or not buy) a certain car? 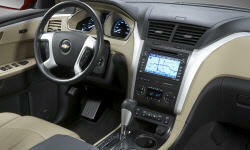 TrueDelta's members share Chevrolet Traverse pros and cons based on their real-world driving experiences. Loads of power for a V6. VERY smooth when vehicle changes gears, almost un-noticable. No hesitation when engine accelerates. No clunking of gears when changing from park to drive, or from reverse to drive. Engine runs very quietly. The headrest position is horrible for long trips. Felt like my head was being pushed forward. It is very egg-shaped, has high beltline. I notice that with the A/C on it hesitates on take off. Similar to Enclave -- but sportier.